The markets work on shocks to expectations: when our tax contacts are shocked, that’s something you need to know. 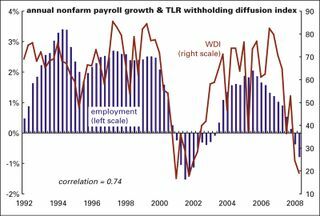 And please note that both our WDI and our SDI picked up the current weakening trend early in the year. Please read through our Sample Report directly below to see our work, as it was published, for yourself. We’ve been warning our readers for decades about crucial trends before they were visible: the 2001 profit squeeze, hidden weakness in the labor market that led to several big downward benchmark revisions, research in 2006 showing that the then-current housing boom was an anomaly in US history, so preparing our readers for what was to come. We also flagged a sudden reversal in remittances to Mexico that signaled the housing collapse, and both recent collapses in oil prices. 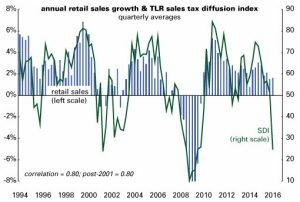 We pushed back on the idea that we were heading back into recession in 2012/13 because state-level withheld and sales receipts, while not great, were holding up. 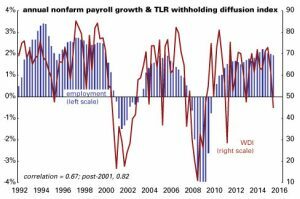 And, although it has been pretty monotonous, we began warning in 2009 that we were in for a decade-long slog through a swamp with chronic slow growth and inflation too low for the FOMC. For the last few years the FOMC, unfortunately, has been the only game in town, and we’ve providing steady, insightful analysis of what we knew they would do: work to overcome the stagnation that follows a financial crisis until there are real signs that wages are picking up, as they may, finally, be doing these days.